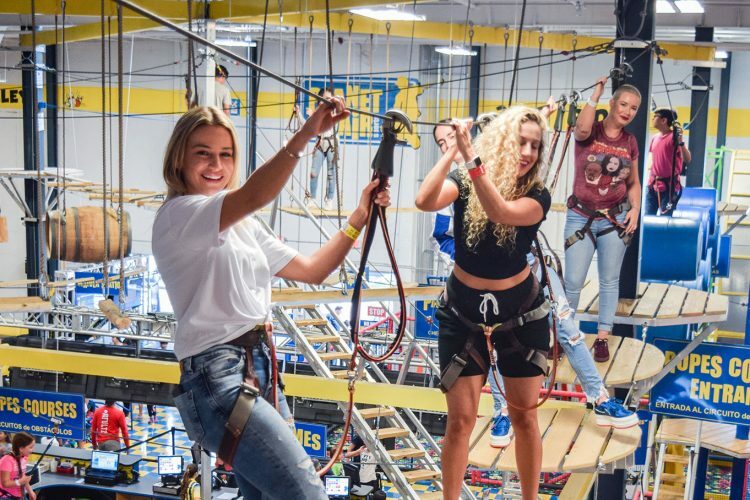 ENJOY CHALLENGING ROPES COURSES AND ZIP LINES FROM ABOVE! Imagine being 15 feet above the floor, wearing a harness that is attached to a rope. We have two exciting and challenging Ropes Courses. Our lower ropes course is for everyone that is 45″ and up and it has 14 challenging elements. 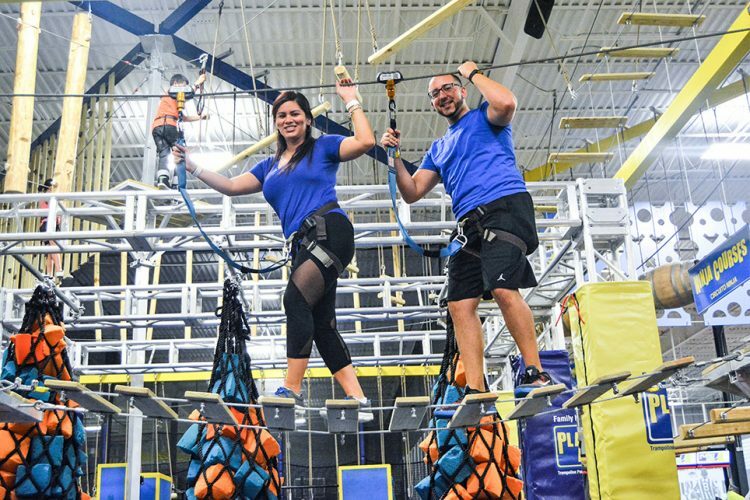 The upper Ropes Courses is for everyone that is 56″ and up with 21 incredible obstacles. 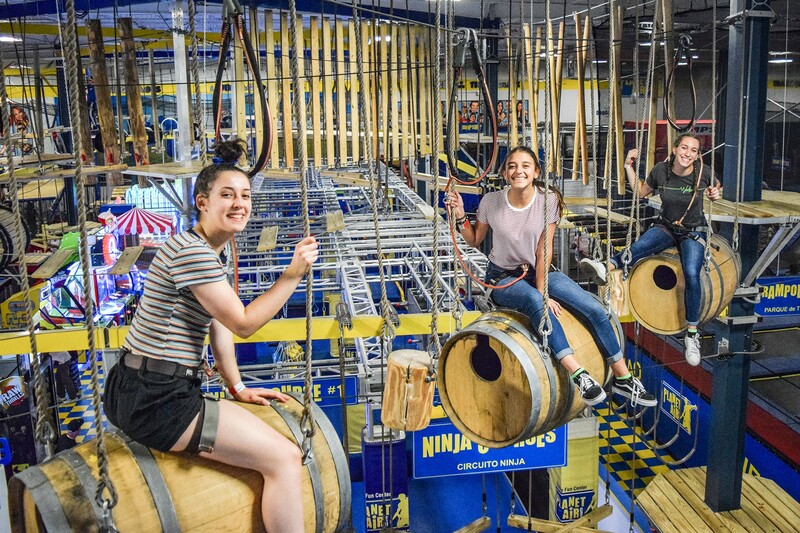 You are balancing through ropes, going through barrels, walking on planks, cubes, moving bridges, riding a skateboard attached to a wire and you will also be suspended on tires! 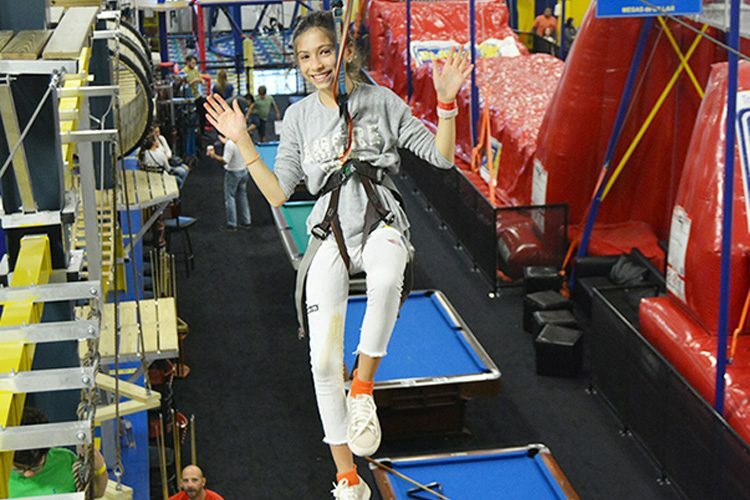 You can also soar through the air on Florida’s only indoor Zip Line! Zip along the high tops of our attractions at an exciting speed. What an amazing feeling you’ll get while in flight! Our ropes course is designed to boost your imagination, coordination and challenge your physical capabilities. This is also an excellent attraction for team building. Minimum height lower level 46". Minimum height upper level 56". CLOSED SHOES OR SNEAKERS ARE REQUIRED. - Participant Maximum weight is 250lbs. 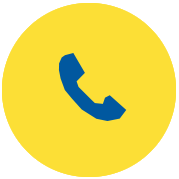 - Ensure that your shoes are secure. No Flip-flops or open heel shoes. - Please make sure your shoe laces are tied. - Pockets must be empty. - No loose objects such as cell phones or cameras. Eyeglasses should be secure. - Operators are not responsible for lost or misplaced personal items. - No hanging or horseplay. Operator reserves the right to expel participants from the attraction if exhibiting this behavior. - Attraction is not recommended for guests with the following conditions: Pregnancy, Neck problems, Back Problems, Heart Problems, Recent Surgery or any history of physical condition that may be aggravated by this attraction.